Welcome back for a new school year! We are excited to start a new semester at the University of Ottawa with uOSFL. We had a good start to the fall semester last week at the 101 Week clubs fair. 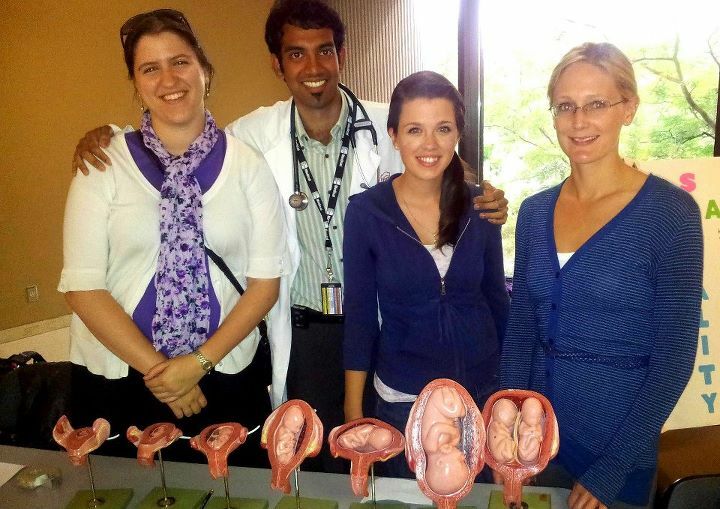 We had managed to find fetal development models, which were very successful in attracting many people to come and discuss life issues. 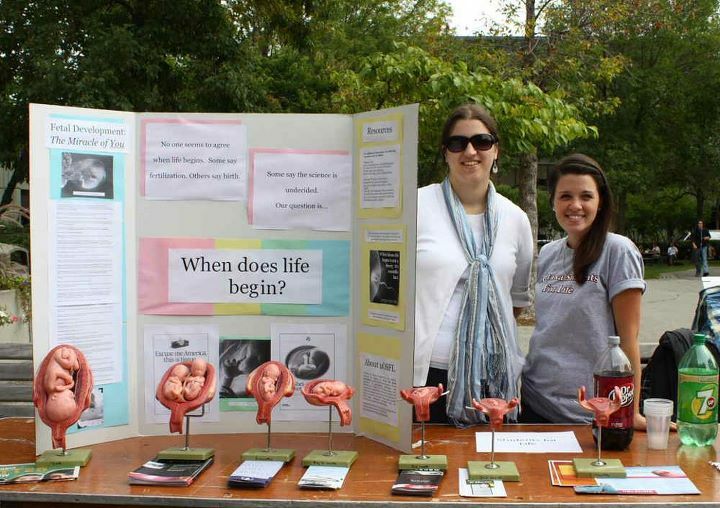 We had several students involved in polite and intellectual discussion about abortion and the question, “When does life begin?” Prior to this, we helped medical students get their first table up and running at the med students clubs fair. Please check us out on Facebook for more pictures of our first week back! This entry was posted in activism, events, uOSFL and tagged activism, by Elizabeth, uOSFL, uOttawa on September 12, 2011 by uOttawa Students For Life. In the federal election debates, no one even so much as mentioned the word “abortion.” And Harper has explicitly said that he will oppose any motion or bill that reopens the abortion debate. However, this does not mean that there is no point in voting pro-life. It is important to ensure the rights of unborn children and the rights of pregnant women are respected and protected in this county. For more information on elections and pro-life issues, see Campaign Life Coalition’s election page. May we never forget our most humble roots and continue to stand up for the thousands and millions of unborn children, our human brothers and sisters, who lose their lives to abortion. Remember why you are pro-life. Vote on May 2, 2011. This entry was posted in abortion, advocacy and tagged abortion, abortion politics, by Elizabeth, Campaign Life Coalition, federal election, harper, Live Action, right to life, vote on April 21, 2011 by uOttawa Students For Life. Joseph Maraachli is a one-year-old baby who depends on a ventilator to live. He is dying of an undiagnosed neurodegenerative disorder. His parents, who lost a previous child to a similar disease, want the doctors to perform a tracheotomy, like they did for their daughter, to enable them to care for their dying son at home. The hospital refused and has instead tried to force the parents to consent to removing the ventilator. The family has fought back courageously, and right now they are trying to get baby Joseph transferred to another hospital where he will get the treatment he needs. As a nursing student, it seems to me that the parents shouldn’t have to fight to try and provide comfort care for their baby so he can die with them at home. The doctor said that the tracheotomy would be risky and that Joseph would suffer; however, in front of the tribunal, the doctor stated that Joseph couldn’t feel pain and was in a permanent vegetative state; he didn’t respond to stimuli. However, as this video shows, Joseph is not vegetative, as he is moving to his parents’ stimuli. I can’t help asking myself: what is the hidden agenda here? Why can’t the relatively simple and humane request of the parents be granted? They are, after all, the first decision-makers for treatment for this baby. While I don’t have all the medical facts of the case, as a sister, if my little brother were dying and there was nothing more the hospital could do for him, and there was a way to make him comfortable at home, I would want that. The Maraachlis aren’t asking for a miracle: they are asking for good palliative care. If you are interested in supporting the Maraachlis as they go through this ordeal, please join the “Save Baby Joseph” Facebook group or go to any of the articles linked to here and scroll down to see how you can help. Follow the rest of story here, here and here. 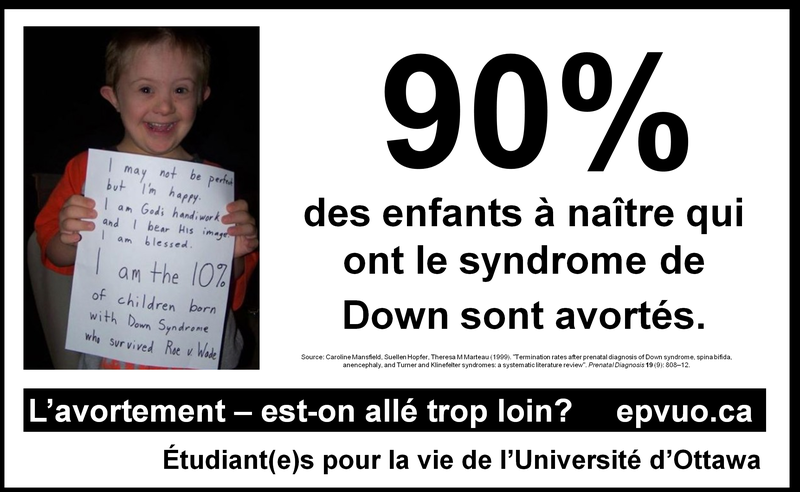 This entry was posted in ethics, legal issues, news and tagged Baby Joseph, by Elizabeth, Canada, Euthanasia Prevention Coalition, medical ethics, news on February 26, 2011 by uOttawa Students For Life. Happy New Year from uOSFL! Merry Christmas and a Happy New Year to all readers! they won the $25,000 prize with 2015 votes! (See this post and this website.) Congratulations to the Kamloops Pregnancy Care Centre! The winner of Action Life’s video contest can be found here. It’s a very powerful video and very well done. I highly recommend it. consulting this website and this one for information on vaccines. This entry was posted in for your information, news, support and tagged Action Life, by Elizabeth, news, Resources, vaccines on January 2, 2011 by uOttawa Students For Life. I’m very excited about November being Adoption Awareness Month because as a pro-life group, we talk about choosing life instead of abortion, but we don’t typically talk as much about adoption specifically. Just the other day, I found a great new site: adoptionincanada.ca There is information about how adoption works and testimonials of mothers who have placed their babies for adoption. Even in my own community, I know several people who were adopted and are very grateful to their birth mothers for the gift of life and a loving family. Adoption is not easy, but it’s a choice that both mom and baby can live with. This entry was posted in adoption, for your information, women and tagged adoption, by Elizabeth, mothers, Resources on November 20, 2010 by uOttawa Students For Life. Amazing story. Personally, I don’t see why women want to have the right to be so abused in this fashion. We are worth so much more. 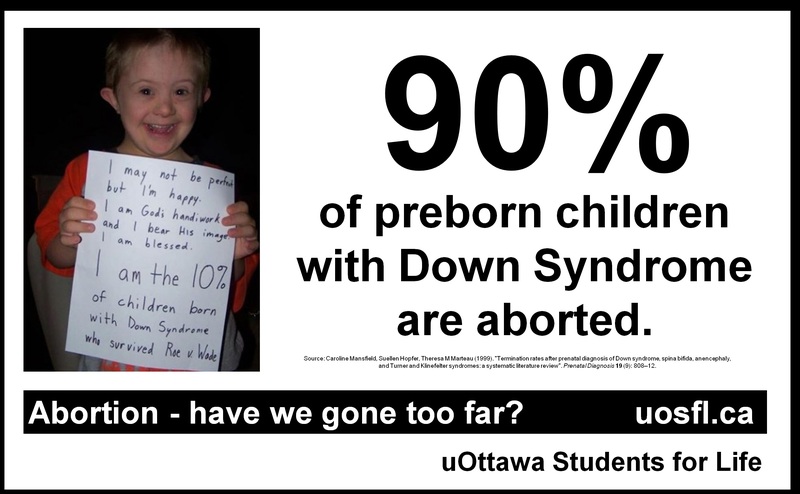 This entry was posted in abortion, activism, uOSFL, women and tagged abortion, abortion politics, activism, by Elizabeth on October 16, 2010 by uOttawa Students For Life.